Pros: Exceptional mass/strength gains, Exceptional cutting effect. Cons: Side Effects, Hard to find, Counterfeited (UGs don't contain trenbolone). 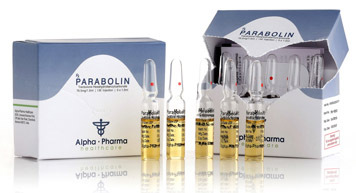 Description Parabolin (Trenbolone hexahydrobenzylcarbonate) 76.5mg/1.5ml, 5amps, Alpha Pharma: Parabolan is an injectable applicable steroid with a great effect on the protein metabolism. Parabolan promotes strength and size gains. Usual dosage is 200 mg per week. Parabolan is one of the best effective anabolic, promoting protein synthesis as well as creating a positive nitrogen balance. Appetite stimulant and for the improvement of the conversion of proteins. In laboratory tests it has been demonstrated that Trenbolone hexahydrobencylcarbonate increases protein and decreases fat deposition. It has proven to be an excellent product for promoting size and strength in the presence of adequate protein and calories, promotes body tissue building processes and can reverse catabolism.